Written by Will McCardell, Philip Minchin, Mark Seifter, and Jerome Virnich. Cover Art by Emily Fiegenschuh. I picked this up because I was picking up an arcane class and curious as to the additional options that came out. It's a book that applies to multiple classes, one of the more interesting archetypes given a game to pick up might be the story behind the Paladin with a familiar and its a good story creation stand point. Not only does this open up various familiars but gives even better options for the character. These days, I generally find myself growing tired of books that are almost entirely crunch. There's so much out there already that, unless the new stuff is exemplary, it just ends up seeming forgettable. Familiar Folio, however, is a definite exception. It expands the game in an area that has seen very little expansion, and thus is far more memorable. It is a very welcome resource and will add needed new levels of fun to familiars. Originally posted at Throat Punch Games, a new idea everyday! Basics-Every great wizard has a familiar, why can’t you! 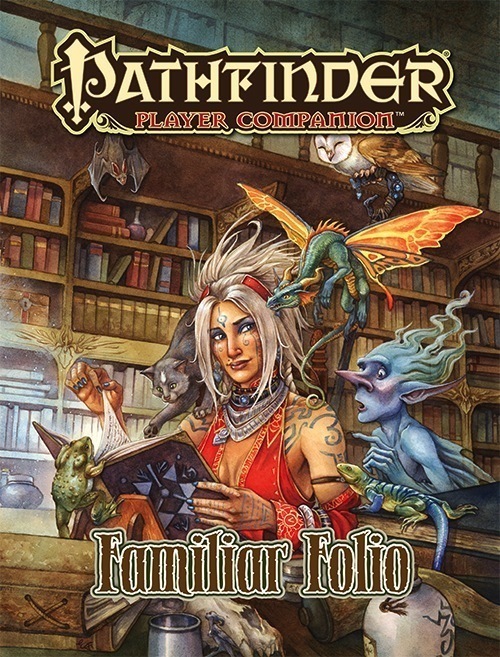 Familiar Folio is a Pathfinder Player Companion book discussing familiars, how to add them to new characters, and how to improve them. Like every other book in the companion line, it adds new feats, archetypes, items, spells, and other options for players and their familiar’s alike. I think this book does what it sets out to do: make familiars more useful, engaging, and tied into character flavor. But it doesn't make me want to run out and create any characters (although the Chosen One is pretty sweet). Mostly, it'll wait until one of my players says "ooooo, can I have a familiar?" I have a more in-depth review posted here. This book offers all sorts of Familiar related options, as would be expected from something titled "Familiar Folio", giving Familiar Options to the Paladin, Bard, Fighter, and Druid, as well as a host of flavorful familiar-centric archetypes to the Magus, Alchemist, Wizard, and Witch. Even the Familiars themselves get archetypes! When the tagline up there says "Excel in combat", they weren't joking! what keeps this book from 5 stars is the complete lack of acknowledgement that the Shaman class even exists, even going so far as to say the witch is "the only character class that has familiars as an integral part of its abilities". while I'm not the biggest fan of the class, it still seems pretty negligent. Ooh! Sounds interesting. What to choose- animal companion or familiar? That's funny; I have notes on publishing something similar. At least no one will be able to say that familiars aren't well-supported! Whoo! And now a similar book about animal companions, with a revised version of Monstrous Mount and an Improved Companion feat! I am really interested in what improved familiars are in this book. Animal Archive: Boon Companion on page 18 is essentially the Improved Companion feat. I believe we got the swan in B4. Also there is a pretty good book called Cats, Dogs, and Horses by 4 Winds Fantasy that has various dog and cat familiars along with a micro horse. What I meant was, a version of Monstrous Mount without the weaknesses that many have complained about for that feat (reduced flying speed, for example). Boon Companion lets you have a higher-level companion if you are a multiclass PC, but what I really want from an Improved Companion feat is the ability to take something other than an animal for my animal companion (an expanded Monstrous Mount, perhaps, without the "mount" limitation). The swan in B4 is an animal companion and I like it. I want a swan familiar too, though. Since it's a Small creature, it should do. I know all the 3PP dog familiars, but I still think that an "official" one is needed. The trumpeter swan in Bestiary 4 is an animal companion, though, not a familiar. Hmm, it's listed as small, which is surprising, since trumpeter swans tend to be somewhere between 4'6" and 5'5" in length, though some have gotten up to 5'11"...which in my opinion would place them squarely as a medium creature. There are smaller swans, though I'm not really an expert...but I think even the smaller ones often hit over four feet in length in general, so not sure they're really familiar material, due to their size. I could be wrong, though! We technically already have ferrets...they're a kind of weasel (along with stoats, minks, and some kinds of polecats). Similarly, we already have basic monkey familiar, and considering marmosets are a kind of monkey, I don't see any reason why you couldn't have a marmoset familiar already. No dogs except as an animal companion, though, that's true. My barbarians can now have a Pipefox! YAISE!!!!!! Tiny elementals for level 1 familiars please!!! Obtain Familiar feat? Would be about time. I can't wait to see rules for any class gaining a familiar and the battle familiar stuff sounds cool as well. Hoping for things like beetles and insects as well. I do believe I'm getting the vapors! Much excitement I have for this. Hoping for a Kea familiar. Destructive and cheeky parrots FTW! How hard is that to stat out? Swap out the familiar bonus for a +3 to Disable Device instead. Now for PFS, then yeah, we need one in this book. I think I'd prefer an IKEA familiar. Secure Shelter, anyone? How is this going to be different from the animal book that came out a year or so ago? I think that one was geared more towards animal companions and this one is more towards familiars. Yes. This book will be far more familiar. I am hoping for rules for the wasps that Calistrians use as familiars. Do you mean the book will be FARmiliar ? So a way for any character to pick up a familiar other than the "Be 3rd level and have Cha 13 to take Eldritch Heritage (arcane bloodline)" hack? There are balance issues one must look out for, but I'm pretty sure I could do that. Please, Tiny Elementals as familiars from the start. So you don't have to have an animal for the first five levels and then switch out to the elemental when you finally qualify for Improved Familiar. Elementals are already established as familiars by the IF feat, just let us pursue the theme from level 1. I don't care how weak you have to make them, nerf them to heck and back, just let me have a fire theme going from the beginning? Please, Tiny Elementals as familiars from the start. I second this. Give me the swirrly thing. I mean Air Elemental. I know this might be late but you know what I would want to see as a familiar option? Turkey and a peacock. The former gives you toughness, the latter a +3 on Bluff or Diplomacy. I could see peacocks granting Intimidate instead. The only reason they spread out their feathers is to make themselves look larger then they actually are in an attempt to ward away predators. A decision between Bluff and Intimidate makes more sense to me, personally. 2nd level if you don't want to make it OP. Turkey also give you a penalty to save vs. sleep effects. I'd say a ginger raccoon is just as good as a red panda. Awesome! I am very excited to see this book! Any chance of us seeing an archetype or spell to speed up "scry on familiar" so it doesn't take an hour to cast? Given everything we need to cram into this book, probably not. Oh well, I am sure it will still be a great book! It's definitely a good sign that there is too much content (instead of not enough). D&D 3e had an Extra Familiar feat from one of the Dragon Magazine issues as well as an Obtain Familiar feat from Complete Arcane I think, you just needed arcane caster level 3rd and Knowledge (arcana) 4 ranks. No one cried out abuse with those. Shadow familiars to round out the fiendish and celestial ones.